West Highland White Terrier dog breed information profile includes history, appearance, size, temperament, lifespan, health, training of West Highland White Terrier dogs and puppies. 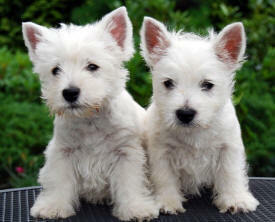 Thinking about adding a West Highland White Terrier dog or puppy to your family? Check out our West Highland White Terrier Adoption Listings. The West Highland White Terrier is an immediately recognizable breed, famous for its quick pitter-patter, snow white coat and its celebrated cuteness. 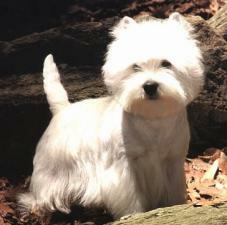 Like many terriers, the Westie was first bred in Scotland and has since been adopted the world around. The West Highland White Terrier makes a truly lovable pet and will heed commands when he is trained and socialized early. The West Highland White Terrier is well known for its alertness and bold constitution. For this reason, the Westie makes a terrific watchdog, but his protection ability is dubious. Fun-loving and devilish, the West Highland White Terrier promises endless fun and camaraderie. As the name hints, the West Highland White Terrier hails from Scotland. At one time, several terriers, including the Westie and the Scottish Terrier were all considered one diverse breed. But, breeders began selectively breeding for colours that would be distinctive to specific regions in Scotland. Legend holds that in the early 1900’s , Colonel E. D. Malcolm bred generic terriers for hunting. The colours of these dogs ranged the spectrum from black to white with liberal offerings of a reddish hue. Apparently, one of his red coloured terriers was mistaken for a fox and shot. So, all dogs thereafter were bred to be white so they could easily be identified from a distance. And so the modern day West Highland White Terrier was established. Today, this industrious and affectionate dog is a fierce competitor in the show ring and lovable companion in homes the world round. The West Highland White Terrier was bred for its specific function. Its small, compact stature, short legs and narrow gait made the Westie a formidable fox hunter, easily fitting into dens and burrows. The jaws of a West Highland White Terrier are more menacing than its fluffy white moustache would imply. This was a necessary attribute for confronting a fox in the cramped space of a den. But today, most suburbanites have little need for ferreting foxes out of dens. Instead, the West Highland White Terrier’s main function is to look unbearably cute. Indeed, he is a master at his craft. The West Highland White Terrier is a sturdy, albeit small breed with a white, wiry coat. The Westie does have an undercoat and he will shed, but not in vast amounts when compared to other breeds. The West Highland White Terrier has naturally pointed ears and a tail resembling an inverted carrot. His eyes are black, expressive and almond shaped. The Westie`s beard and moustache are generally kept just longer than his 2 inch coat. 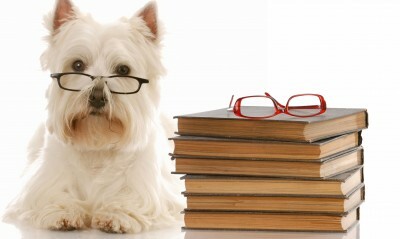 The West Highland White Terrier is the Alice Kravitz of dogs; a bit of a busy-body and always in the thick of things. The Westie is spunky and energetic and will welcome all games involving sticks and throwing. The West Highland White Terrier is very affectionate toward its owners, but can be surprisingly yippy, and possible nip at small, unfamiliar children. This distain extends to all other dogs and the Westie can be hostile and at times unexpectedly aggressive. The West Highland White Terrier has a distinct personality and undeniable attributes. The Westie is bold and courageous, self reliant and has a self esteem to be envied. He is demanding of your attention and can sulk if he feels neglected. Similarly, West Highland White Terriers seem to relish pampering, but be warned that the Westie has a clear, uncompromising self image. And, should your groomer and your Westie have a differing of opinion, your Westie will be in a grump for a few days. Finally, your West Highland White Terrier will dig in your garden to bury and retrieve treasures so if you are planning a garden party, keep a watchful eye on your Westie. He is a skilled and cunning breed and may uproot your daisies in the blink of an eye! The exercise needs of your West Highland White Terrier are easily manageable. He will need a moderate daily walk, but he can manage with an occasional afternoon of yard play if a walk is not possible. The Westie loves to frolic in grass and will play for hours any game you choose. This dog is a quick study and you will enjoy his ingenious attempts to find hidden toys and thrown sticks. The West Highland White Terrier needs regular and at times frequent brushing to maintain his coat. The Westie`s undercoat will shed in spring so brushing more often will limit fury floors. The West Highland White Terrier will need clipping every three months or thereabouts to maintain the distinctive shape of the coat. Show dogs will have their coats stripped and it should be done professionally. The pure white coat of the Westie can test your patience. There are places throughout North America where the soil is rich in iron and is therefore reddish in colour. This can be maddening for a West Highland White Terrier owner, as every outing can tarnish the otherwise snow-white coat. At the very least, it will certainly mean more regular baths for your Westie. Those West Highland White Terriers with particular inclination for digging will also needs more baths, regardless of the soil colour. At bath time, be sure to place cotton balls in your Westie’s ears to stave off ear infection. The thing about training a West Highland White Terrier is that Westies usually interpret all interaction as play. This can prove tricky when trying to teach your dog obedience. This, coupled with the Westie’s self confidence and high energy, can make even a seasoned dog trainer lose his will. But fear not, experts generally agree that crate training is a fundamental ingredient to success and your West Highland White Terrier can be trained using this and other tactics. Westies den by nature and will welcome the security and seclusion of his crate. Typically, he will not mess his crate so taking him immediately outside after naps will establish an acceptable bathroom routine. Resist feeding your West Highland White Terrier with your family. Feed him afterwards and from a dish placed on the floor. This teaches your Westie early on that his position in the family hierarchy is below that of all other members. Also, allow your West Highland White Terrier a few quiet moments before training begins and try to reserve a quiet, low tone of voice for training. This calmness will signal training to your Westie and he may be more apt to be obedient if he knows obedience is expected. Keep the sessions short and praise acceptable behaviour. You can signal the session’s end when you change your tone of voice to a higher, more playful tone. As with all purebred breeds of dog, health problems of a hereditary nature can occur in puppies. Your best insurance against acquiring a Westie pup with health issues is to choose your breeder very carefully. A reputable and responsible Westie dog breeder will be well educated about the West Highland White Terrier dog breed, and actively screen the dogs in her breeding program to ensure that these dogs are healthy and free from congenital disorders that might be passed on to the puppies. When it comes to canine genetics, there are no 100% guarantees against a disease that is prevalent in the breed showing up, since these disorders can often skip generations, however, buying a Westie puppy from a breeder who is fastidiously careful in her breeding program will be your best chance of a healthy, long lived, well tempered and joyful Westie puppy. Major health concerns for the West Highland White Terrier include Globoid Cell Leukodystrophy (Krabbe’s Disease), Legg-Calve-Perthes Disease (Avascular Necrosis of the Femoral Head, Craniomandibular Osteopathy (CMO) , and various skin diseases. Minor health concerns include Copper Toxicosis, Cataracts, Patellar Luxation and KCS. Deafness presents occasionally. Is a Westie the Right Breed of Small Dog For you? The West Highland White Terrier is a fun-loving, inquisitive dog that will fill your days with cuddly companionship. The limitations for owning this dog are few; notably, the grooming can be a headache and Westies can be vocal at times. Beyond that, the Westie is an affable pet and will welcome well behaved older children as his friends. 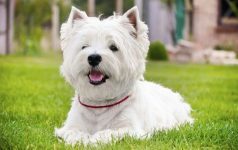 The West Highland White Terrier can live happily in an apartment as long as you are willing and able to walk him daily. Homes with fenced yards make excellent homes, providing you are not planning to enter a gardening competition as your Westie will certainly add his own touch to the display. On the whole, the Westie makes an excellent and mightily handsome pet. As with purchasing any dog, resist the urge to purchase a West Highland White Terrier inexpensively from a pet store or from an advertisement in a newspaper. You may unwittingly buy a mal-adjusted, sick, puppy mill dog. This is to be avoided at all costs.